5 Star Accounting and BusinessBusiness Should I consider hiring a partner? Running your business requires a lot of energy. It also may demand a lot of time, some of it spent alone. These factors can lead to burn out, the last thing you need as you build momentum and grow your business into what you’ve always envisioned. If the workload is beginning to take its toll, it may be time to look to bring on some help. 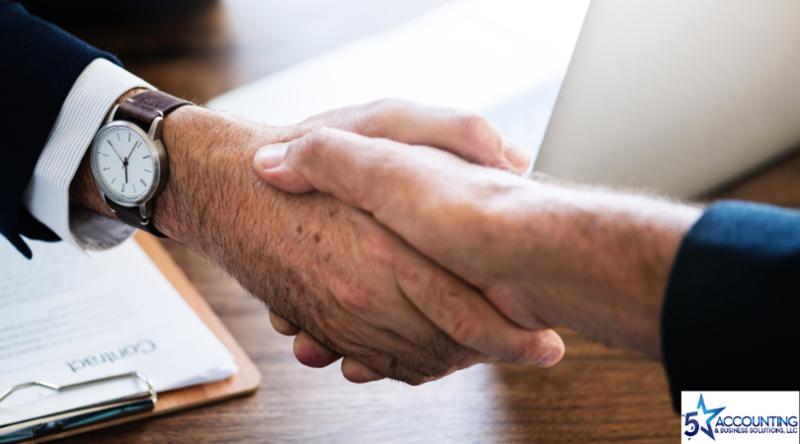 Partnerships can help alleviate the growing pains you’re feeling as a new business entrepreneur, and set you up for tremendous growth as you get your footing and find your rhythm. But, is bringing in an outsider advisable? Here are some pros and cons of it. Adding a partner boosts your company’s depth and expertise. This versatility will alleviate responsibility so you can handle other duties, such as thinking about the long-term and providing some much-needed efficiency into your workflow. An ideal partner will complement your skill set, knowledge and experience, making the most out of your investment in this new partnership. A new voice in your company will also bring a fresh perspective and new ideas. Most importantly, this new partner can provide a second opinion on the decision-making process. As your business grows, you’ll be faced with some key decisions, and a second voice can be invaluable as you plot your course to success. In addition to these payoffs, a partner will also give rise to greater accountability within your company. As a solo businessperson, there’s no one really to answer to and have a discussion with. A partnership changes that dynamic. A partner will help your business focus, evaluate decisions with greater objectivity and hopefully boost productivity. Adding a partner, however, can have its downsides. The biggest change is giving up ownership and what you have already built. When a small business adds a partner, the impact will be felt across the enterprise, so, it’s important that you set up clear roles and responsibilities. In addition to giving up power, a fresh voice could lead to a clash of visions on business strategy, hiring, marketing and other important aspects of business. These disagreements could strain the working relationship and waste valuable time. Decision-making could also suffer with the addition of a partner. Whether you’re not on the same page, or decision-making procedures are made more complex through a partnership, the downsides of adding a partner can be crippling so it is important to do your due diligence when finding someone. Get your entire business team involved with this decision including your accountant and attorney(s). If you’ve already been established, running your business and have an equity position in the company, you will need to consider tax implications of selling or transferring any ownership. It’s not worth the sudden surprise at tax time to learn that either of you get stuck with a bill you didn’t expect. This may be a great time to visit your existing business structure and form or convert to best benefit all those involved. Talk to your tax advisors before making this leap and fully understand all of the implications. Sit with your own attorney alone and a business attorney together before you engage and fully understand the risk and reward. They should help you draft a proper partnership agreement that is agreed upon with very specific expectations and understanding between you. For example, getting in is just as important as getting out. What happens to ownership if something catastrophic happens to one of the partners? Would you want uninterested parties taking over? Be sure you discuss the difficult issues and arrive at agreeable terms that keep your business in motion. There are so many factors to consider and an attorney will help you sort through it and think about the things that you may not have otherwise – it’s worth the investment. Partnerships are not the end-all-be-all to engaging invested help and maintaining good leadership. Work with your team, or business advisory consultants, and brainstorm your options, including profit sharing plans or bonus structures without giving up equity in your company. Adding a partner, obviously, comes with its rewards and risks, but no great business ever got where it did without risk, and without strong partnerships. The addition of a new partner can be a great asset, if it’s the right fit. It can lead to tremendous growth and when executed the right way, it can instill within you a renewed confidence to take on the world.